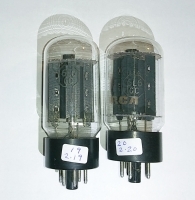 572B AND 811A TUBES IN STOCK! 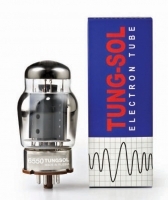 OPEN THIS SECTION FOR ALL POPULAR POWER OUTPUT TUBES FOR AUDIO, GUITAR AMPS AND GENERAL AMPLIFER SERVICE.. INQUIRE FOR TYPES NOT LISTED. 6C33C AND EL509 MATCHING. 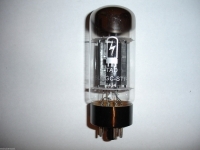 WE NOW USE A CUSTOM TUBE CHECKER BY GEORGE KAYE TO MATCH 6C33C AND EL509 FOR YOUR AUDIO APPLICATIONS! 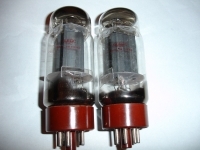 WE CAN ALSO RATE YOUR TUBES FOR EARLY OR LATE DISTORTION TO ACCOMODATE YOUR PLAYING STYLE. 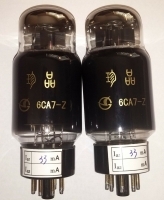 WHEN INSTALLING POWER TUBES PLEASE TURN DOWN YOUR BIAS(increase negative grid voltage) SO THAT A MINIMAL AMOUNT OF CURRENT FLOWS THROUGH THE TUBES. 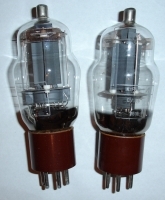 AFTER WARM-UP INCREASE SLOWLY UNTIL YOU REACH RECOMMENDED SPECS.IF YOUR BIAS CURRENT IS TOO HIGH YOU CAN BLOW THE TUBES, IN WHICH CASE THE WARRANTY IS VOIDED!! 6550C SED =C= matched pr.